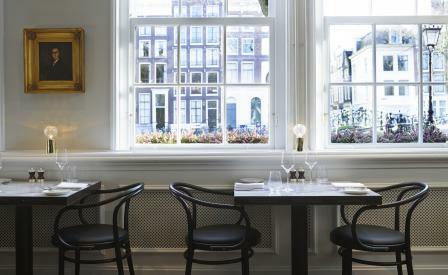 As has long been the case in cities such as New York and London, Amsterdam’s hoteliers are realising their battlegrounds are not just the markets for business travellers and tourists. As the city’s hotel offerings continue to swell, so to, its selection of bars and restaurants connected to said hotels, that are positioned as stand alone venues in their own right. The latest, Jansz, is found adjacent to the famed Pulitzer hotel, in an uncharacteristically large corner site in the city’s famed Nine Streets district. Converting multiple canal houses, designer Jacu Strauss has created an impressive collection of spaces, beginning with an evocative and atmospheric entrance area housed inside a UNESCO listed former apotheke. Inside, suede upholstered banquettes face a central open kitchen, lined with marble benchtops and table settings for those seeking a spot observing the chefs at work. Executive Chef Cassidy Hallman has comprised a menu rich in familiar hotel and bistro fare, from steaks, tartares and burgers to nicoise and ceasar salads, oysters and a selection of more inventive main courses. Past the kitchen, a large canal-fronting dining room is peaceful, relaxed and light filled by day, and a handsome, moodily lit affair by night.